We are a leading Manufacturer of solid rubber tyred wheels (srt) and bonded rubber tyred wheels (brt) from Ahmedabad, India. Solid Rubber Tyres are moulded in natural Rubber in black color under Controlled Temperature and Pressure. 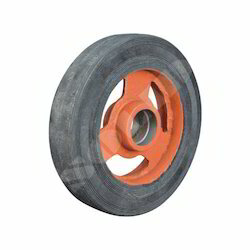 Solid Rubber Tyre is mounted on to Pressed Steel Zinc Plated disc. Bonded Rubber Wheels are mounted on Cast Iron center with Black Natural Rubber under Controlled Temperature and pressure providing a single solid unit. These wheels can be used in any type of flooring which does not damage the floor and moves smoothly and silently. It has high load capacity, low abrasion and maintenance free. Wheel Hardness: 90 (+/- 5) shore A Scale.